A princess pirate party offers up plenty of fabulous and fierce ideas for anyone who wants a fantastic party, regardless of age. This themed party idea has many possibilities that are sure to entertain and amuse your guests. 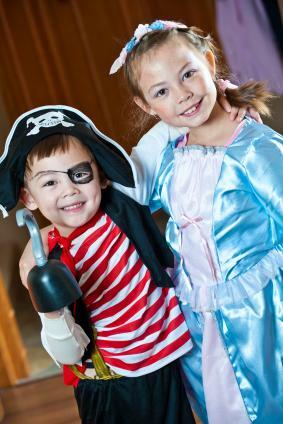 A princess pirate party offers a good way to include both boys and girls in a themed birthday party where both genders are invited, as well as a good Halloween costume theme party. You can create your own invitations on a computer using a word processing program or card making program. Another idea is to use a pirate invitation and embellish it with pink glitter and sparkles. You can do the same for a princess invitation and use red and black glitter. If you want children to attend dressed like a princess or a pirate, specify this on the invitation. Children can create their hats and crowns at the beginning of the party and wear them throughout the event. In addition to the activities listed above, consider hiring a birthday party entertainer or two to come visit the children's party. Both a princess and a pirate can come and tell stories, paint faces and lead children in games and other activities that are sure to delight them throughout the party. Decorate your party with a mixture of princess and pirate theme plates, cups and napkins. You can have a pirates' table and a princesses' table with appropriate table coverings and centerpieces. Alternate black and red helium-filled balloons with pink and lavender balloons and tie these to the backs of chairs or to a basket filled with party favors placed in the center of the main table. In addition, string crepe paper in similar colors across the ceiling and over doorways. Be sure to give all the favors to the boys and girls alike so no one feels left out when the party comes to a swashbuckling end. You can use pirate and princess cookie cutters to make small shaped sandwiches. Serve snacks such as goldfish crackers, pretzels and chips. Offer two drinks to children, a dark red or purple pirate punch and a fizzy pink princess drink. The cake you choose for your child's party really depends on how you want to incorporate the princess and pirate theme. You always have the option of either purchasing two cakes, one decorated in a pirate theme and the other decorated in a princess theme. The pirate themed cake could be chocolate, and the princess themed cake could be strawberry or vanilla. On the other hand, you could make a large sheet cake and decorate one half in the pirate theme and the other half in the princess theme. If you really want to go all out, however, visit a bakery that specializes in themed cakes and ask the baker if she can create a cake that incorporates a princess and a pirate into one cake. Costumed theme parties are as much fun for adults as they are for children. A princess pirate party is an excellent choice for a fun anniversary party, as part of a Halloween party theme or for a birthday party. In fact, the concept can even be incorporated into a fundraising event or role-play murder mystery game. This is also a good concept for a Valentine's Day singles mixer. Consider taking this entertaining and creative party idea and turn it on its head by requesting that the ladies come dressed as pirates and the gentlemen arrive dressed as princesses. This is sure to create some hilarious photographic moments and spark some truly unique costume ideas amongst the guests as part of an adult party theme. If you want the guests to come dressed a specific way, be sure to mention this on the invitation. Pirate theme party decorations tend to be black and white, with some red incorporated. Princess parties usually have sparkles, glitter and lots of pastels, especially pink and lavender. Consider using printable party decorations or homemade party decorations that allow you to customize the color and design yourself. Alternately, purchase some pirate party supplies and add touches of pink glitter around the outside of the skull and crossbones symbol. Make a faux plank out of cement blocks and plywood and rent a princess castle backdrop to help create the scene. Add small tiki torches and candles inside and out for some mood lighting. A party buffet is one of the simplest ways to serve guests food and drinks. The entire buffet does not have to be themed for the party, but make sure the desserts offered match up to the theme. For example, pirate party food desserts like pirate cupcakes are a perfect ending, as is a princess cake design. Serve drinks out of small barrels ladled into frosty mugs. Rum is a good party drink choice if you want to serve alcohol. Otherwise, consider serving up some pink punch with shaved ice that represents glitter. At a Halloween party, consider bobbing for apples. A murder-mystery party has the activity built right into the theme. At a pirate princess party dance, make sure there is plenty of room to groove and move. A princess and pirate party is a unique spin on a fantasy costume party. With a few easy tweaks, it can go from a children's theme to an adult one, with plenty of fun for everyone!